An experienced user can get the GyroTwister up to 10,000 rotations per minute. The GyroTwister generates rotation power of up to 15 kg. What could be easier than harnessing this enormous power to produce energy? We've done exactly this with the new GyroTwister-Xbeam. Since the GyroTwister Xbeam creates the energy it needs itself, you won't need any batteries. After years of use, your Xbeam will still light up as it did on the very first day. 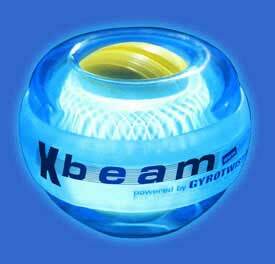 Xbeam works in the same basic way as the GyroTwister Classic. What's different is that the Xbeam has two high-performance copper spools mounted on its rotor, the heart of the Gyrotwister. The spools are guided past permanent magnets that are attached to the Xbeam's outside covering. This creates an induction current. This same principle is used for a bicycle's dynamo lightlamp, where a magnet turning in a spool is powered by the front or rear bicycle wheel as you pedal. The ends of the spool hang outside the dynamo covering, so that the electricity can be used to generate the bicycle's light. This principle had to be modified when we created the new Xbeam. The spools had to be attached to the outside covering, and LED lights were mounted to the covering, to create "constant light". The Xbeam is built completely in reverse to a bicycle light. The permanent magnet is attached firmly to the covering and the spools from which the electricity is derived are located on the rotor. The 6 power LEDs are also attached to the rotor. The result is 4 extremely bright LEDs which, together with the rotor, achieve up to 14,000 RPMs around their own axis. (The Xbeam itself can achieve up to 15,000 RPM, although average human coordination capabilities are far below this level). blue /yellow (blue power LEDs).